Post- doctoral Research: University of Texas Medical Branch, Galveston, Texas, USA., Loma Linda University, Loma Linda, California, USA. 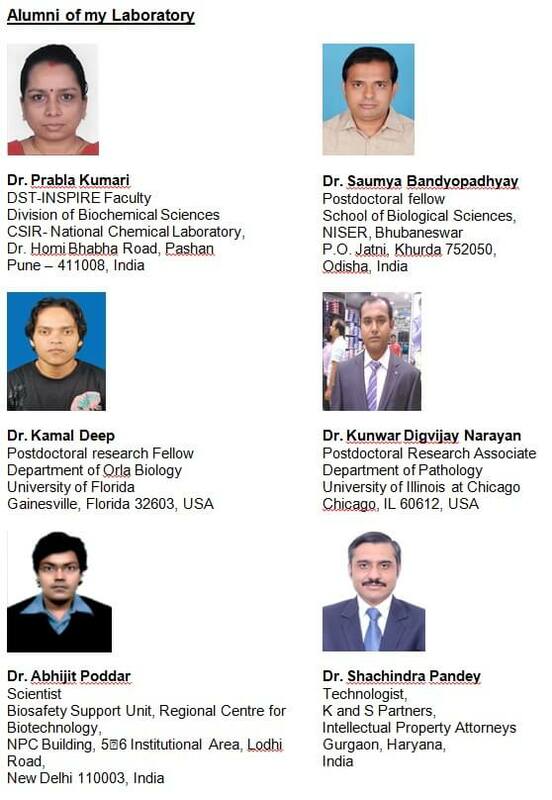 2003-Till date, Scientist, Institute of Life Sciences, Nalco Square, Bhubaneswar. My laboratory is working in the area of environmental microbiology to explore the useful microbes from extreme habitats such as halophiles associated with corals from Andaman Sea and thermophiles from hot springs. In this regard, my Laboratory is working in the area of Geomicrobiology, Microbial chemistry, environmental microbiology and ecology to explore the useful microbes for novel genes, bio-molecules and metabolic pathways. Besides, my research is involved in the development of leading edge technologies for metagenomic gene discovery, molecular phylogenetic approach to investigate microbial gene diversity and community structure and function in various environments. •Prof. KS Bilgrami Memorial Award-2018 from Society for Plant Research, India. E. K. Janaki National Award (2015) from Mr. Prakash Javadekar, Union Minister for Environment, Forest and climate change, Govt. of India. • Outstanding contribution award (2014) from Association for the Advancement of Biodiversity Science, Karnataka, India from Padma Bhushan Prof. Madappa Mahadevappa. • Editorial Board Member: International Journal of Aquaculture and Fishery Sciences. I. To study the mechanism of thiosulfate oxidation in an obligately mixotrophic bacterium Thiomonas bhubaneswarensis strain S10 (DSM 18181T). This study described the mechanism of electron transport during thiosulfate oxidation by T. bhubaneswarensis DSM 18181T. 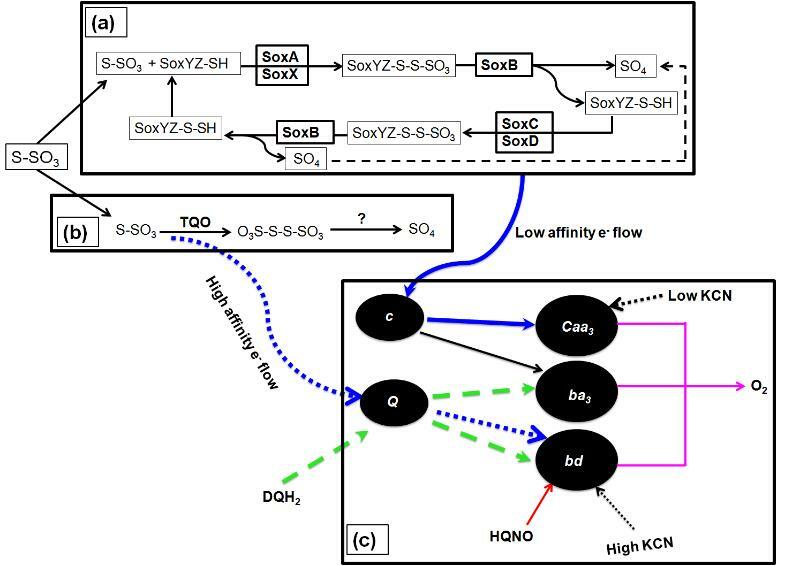 Whole genome sequence analysis revealed the presence of complete sox (sulfur oxidation) gene cluster (soxCDYZAXB) including the sulfur oxygenase reductase (SOR), sulfide quinone reductase (SQR), sulfide dehydrogenase (fcc), thiosulfate dehydrogenase (Tsd), sulfite dehydrogenase (SorAB) and intracellular sulfur oxidation protein (DsrE/DsrF). In addition, genes encoding respiratory electron transport chain components viz. complex I (NADH dehydrogenase), complex II (succinate dehydrogenase), complex III (Ubiquinone-cytochrome c reductase) and various types of terminal oxidases (cytochrome c– and quinol- oxidase) were identified in the genome (Figure). Using site-specific electron donors, inhibitors, and by analyzing the cytochrome spectra, we identified the shortest thiosulfate dependent electron transport chain in T. bhubaneswarensis DSM 18181T. Our results showed thiosulfate supports the electron transport activity in a bifurcated manner, donating electrons to quinol (bd)- and cytochrome c (Caa3)- oxidase; these two sites (quinol oxidase and cytochrome c oxidase) also showed differences in their phosphate esterification potential (P/O). Further, it was evidenced that the substrate level phosphorylation is the major contributor to the total energy budget in this bacterium. This study made significantly to understand the composition of microbiome in the geothermal springs and their correlation with the physicochemical properties of the hot springs by using the metagenomic approach. Metagenome sequence data showed a dominance of Bacteria over Archaea; the most abundant phyla were Chloroflexi and Proteobacteria. 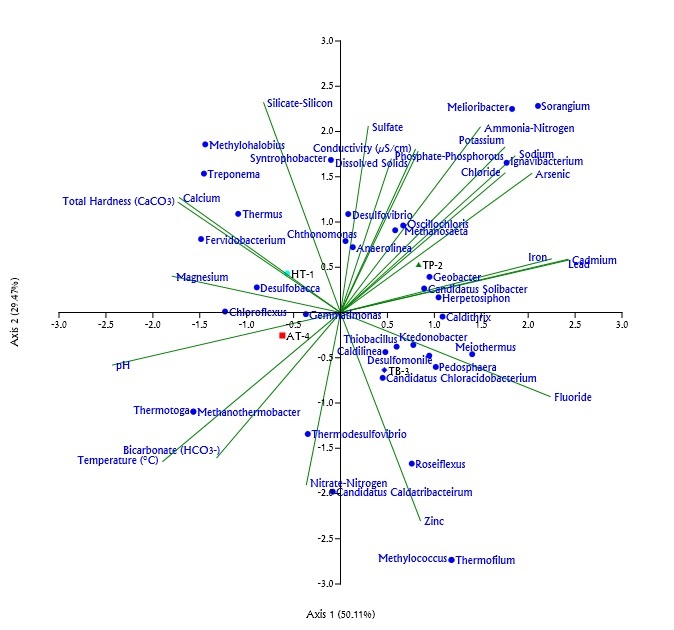 The distribution of major genera and their statistical correlation analyses with the physicochemical parameters predicted that the temperature, aqueous concentrations of ions (such as sodium, chloride, sulfate, and bicarbonate), total hardness, dissolved solids and conductivity were the main environmental variables influencing microbial community composition and diversity (Figure). In conclusion, we have reported the phylogenetic and functional diversity of microbial communities in the hot springs. III. Genomic characterization of two novel chromosomally integrating conjugative elements ICEMfuInd1a and ICEMfuInd1b from a marine bacterium Marinomonas fungiae JCM 18476T. The coexistence of two Integrating conjugative elements (ICEs) of the SXT exclusion group in the same genome is very rare and limited information is available on natural isolates harbouring such SXT/R391 ICEs arrays. Our studies with Marinomonas fungiae JCM 18476T has identified the coexistence of two new SXT/R391-like ICEs (ICEMfuInd1a and ICEMfuInd1b) in the genome. Phylogenetic analysis revealed the two ICEs either evolved independently or high degrees of recombination events have masked their common evolution from SXT-like ancestors. Further, we found that the typical entry exclusion mechanism mediated by the TraG/EeX protein pair was likely defective in preventing the conjugative transfer of a second copy of the same S (SXT) group ICE in M. fungiae due to mutations. Our analysis showed the presence of 16 and 25 variable genes in the hotspots of ICEMfuInd1a and ICEMfuInd1b respectively, many of which were not reported earlier for SXT/R391 ICEs (Figure). Sequence analysis predicted these hotspot regions were shaped by acquisition of genes through homologous recombination between the SXT and R391 related ICEs or mobile genetic elements present in disparate marine bacteria. Prabla Kumari, Jhasketan Badhai and Subrata K. Das*. 2018. Draft genome sequence of Marinomonas fungiae strain AN44T (JCM 18476T) isolated from the coral Fungia echinata from Andaman Sea. Genome Announcements. 6(10): e00112-18. Abhijit Poddar and Subrata K Das*. 2018. Microbiological studies of hot springs in India. A Review. Archives of Microbiology. 200: 1-18. DOI 10.1007/s00203-017-1429-3. Jhasketan Badhai, William B. Whitman and Subrata K. Das*. 2017. Draft genome sequence of Rhizobium pusense strain NRCPB10T (LMG 25623T) isolated from rhizosphere soil of chickpea (Cicer arietinum L.) grown in India. Genome Announcements. 5(17): e00282-17. DOI: 10.1128/genomeA.0028217. Saumya Bandyopadhyay, William B. Whitman and Subrata K Das*. 2017. Draft genome sequence of Pannonibacter indicus strain HT23T (DSM 23407T), a highly arsenate tolerant bacterium isolated from a hot spring in India. Genome Announcements. 5(18): e00283-17. DOI: 10.1128/genomeA.0028317. Sherin Zachariah, Prabla Kumari, and Subrata K Das*. 2017. Sulfitobacter pontiacus subsp. fungiae subsp. nov., isolated from coral Fungia seychellensis from Andaman Sea, and description of Sulfitobacter pontiacus subsp. pontiacus subsp. nov. Current Microbiology, 74: 404-412. doi: 10.1007/s00284-017-1200-7. Kunwar Digvijay Narayan, Surendra Chandra Sabat and Subrata K Das*. 2017. Mechanism of electron transport during thiosulfate oxidation in an obligately mixotrophic bacterium Thiomonas bhubaneswarensis strain S10 (DSM 18181T). Applied Microbiology and Biotechnology, 101: 1239-1252. doi: 10.1007/s00253-016-7958-x. Jhasketan Badhai and Subrata K Das*. 2016. Characterization of three novel SXT/R391 integrating conjugative elements ICEMfuInd1a and ICEMfuInd1b, and ICEMprChn1 identified in the genomes of Marinomonas fungiae JCM 18476T and Marinomonas profundimaris strain D104. Frontiers in Microbiology, 7: 1896. doi: 10.3389/fmicb.2016.01896. Sherin Zachariah, Prabla Kumari and Subrata K Das*. 2016. Psychrobacter pocilloporae sp. nov., isolated from coral Pocillopora eydouxi from Andaman Sea. International Journal of Systematic and Evolutionary Microbiology, 66: 5091-5098. doi: 10.1099/ijsem.0.001476. Jhasketan Badhai, Tarini Shankar Ghosh and Subrata K Das*. 2016. Composition and functional characterization of microbiome associated with mucus of the coral Fungia echinata collected from Andaman Sea. Frontiers in Microbiology, 7: 936. doi: 10.3389/fmicb.2016.00936. Prabla Kumari, Sayantani Bhattacharjee, Abhijit Poddar and Subrata K Das*. 2016. Sulfitobacter faviae sp. nov., isolated from coral Favia veroni from Andaman Sea, India. International Journal of Systematic and Evolutionary Microbiology, 66: 3786-3792. doi: 10.1099/ijsem.0.001265. Kunwar Digvijay Narayan, Jhasketan Badhai, William B. Whitman and Subrata K Das*. 2016. Draft genome sequence of Comamonas thiooxydans strain S23T (DSM 17888 T) a thiosulfate oxidizing bacterium isolated from a sulfur spring in India. Genome Announcements, 4(4): e00834-16. doi:10.1128/genomeA.00834-16. Rinchen T Lepcha, Abhijit Poddar, William B. Whitman and Subrata K Das*. 2016. Draft genome sequence of Idiomarina woesei strain W11T (DSM 27808T) isolated from Andaman sea. Genome Announcements, 4(4): e00831-16. doi:10.1128/genomeA.00831-16. Kamal Deep, Abhijit Poddar, William B. Whitman and Subrata K Das*. 2016. Draft genome sequence of Anoxybacillus suryakundensis strain JS1T (DSM 27374T) isolated from hot spring at Jharkhand, India. Genome Announcements, 4(4): e00824-16. doi:10.1128/genomeA.00824-16. Jhasketan Badhai, William B. Whitman and Subrata K Das*. 2016. Draft genome sequence of Chelatococcus sambhunathii strain HT4T (DSM18167T) isolated from a hot spring in India. Genome Announcements, 4(4): e00825-16. doi:10.1128/genomeA.00825-16. Jhasketan Badhai, Kunwar Digvijay Narayan, William B. Whitman and Subrata K Das*. 2016. Draft genome sequence of Gulbenkiania indica strain HT27T (DSM 17901T) isolated from a sulfur spring in India. Genome Announcements, 4(4): e00830-16. doi:10.1128/genomeA.00830-16. Abhijit Poddar, Rinchen T Lepcha, William B. Whitman and Subrata K Das. * 2016. Draft genome sequence of Tepidiphilus thermophilus strain JHK30T (JCM 19170T) isolated from a terrestrial hot spring in India. Genome Announcements, 4(4): e00832-16. doi:10.1128/genomeA.00832-16. Saumya Bandyopadhyay and Subrata K. Das*. 2016. Functional analysis of ars gene cluster of Pannonibacter indicus strain HT23T (DSM 23407T) and identification of a proline residue essential for arsenate reductase activity. Applied Microbiology and Biotechnology, 100: 3235-3244. Jhasketan Badhai, Tarini Shankar Ghosh and Subrata K Das*. 2015. Taxonomic and functional characteristics of microbial communities and their correlation with physicochemical properties of four geothermal springs in Odisha, India. Frontiers in Microbiology, 6: 936. doi: 10.3389/fmicb.2016.00936. Rinchen T. Lepcha, Abhijit Poddar, Peter Schumann and Subrata K. Das*. 2015. Comparative 16S rRNA signatures and multilocus sequence analysis for the genus Salinicola and description of Salinicola acroporae sp. nov. isolated from coral Acropora digitifera. Antonie van Leeuwenhoek, 108: 59–73. Prabla Kumari, Abhijit Poddar, Peter Schumann and Subrata K. Das*. 2014. Vibrio panuliri sp. nov., a marine bacterium isolated from lobster, Panulirus penicillatus and transfer of V. ponticus from Scophthalmi clade to the newly proposed Ponticus clade. Research in Microbiology, 165: 826-835. Abhijit Poddar, Rinchen T Lepcha, Debasish Mukherjee, Dhananjay Bhattacharyya and Subrata K. Das*. 2014. Comparative analysis of 16S rRNA signature sequences of the genus Idiomarina and Idiomarina woesei nov., a novel marine bacterium isolated from Andaman Sea. Research in Microbiology. 165: 501-507. Kamal Deep, Abhijit Poddar and Subrata K. Das*. 2014. Photobacterium panuliri sp. nov., an alkalitolerant marine bacterium isolated from eggs of spiny lobster, Panulirus penicillatus from Andaman Sea. Current Microbiology. 69: 660-668. Abhijit Poddar, Rinchen T Lepcha and Subrata K. Das*. 2014. Taxonomic study of the genus Tepidiphilus: Transfer of Petrobacter succinatimandens to the genus Tepidiphilus as Tepidiphilus succinatimandens comb. nov.; emended description of genus Tepidiphilus and description of Tepidiphilus thermophilus sp. nov. isolated from a terrestrial hot spring in India. International Journal of Systematic and Evolutionary Microbiology. 64: 228-235. Prabla Kumari, Abhijit Poddar and Subrata K. Das*. 2014. Marinomonas fungiae sp. nov., isolated from a coral Fungia echinata from Andaman Sea. International Journal of Systematic and Evolutionary Microbiology. 64: 487-494. Kamal Deep, Abhijit Poddar and Subrata K. Das. 2013. Anoxybacillus suryakundensis sp. nov, a moderately thermophilic, alkalitolerant bacterium isolated from hot spring at Jharkhand, India. PLoS One. 8 (12). e85493. doi: 10.1371/journal.pone.0085493. Prabla Kumari, Saumya Bandyopadhyay and Subrata K Das*. 2013. Microbacterium oryzae nov., isolated from rice field. International Journal of Systematic and Evolutionary Microbiology. 63: 2442-2449. Saumya Bandyopadhyay, Peter Schumann and Subrata K. Das*. 2013. Pannonibacter indica nov., a highly arsenate-tolerant bacterium isolated from a hot spring in India. Archives of Microbiology. 195: 1-8. Jhasketan Badhai, Prabla Kumari, P. Krishnan, T. Ramamurthy and Subrata K Das*. 2013. Presence of SXT integrating conjugative element in marine bacteria isolated from the mucus of the coral Fungia echinata from Andaman Sea. FEMS Microbiology Letters. 338: 118-123. Madhuban Gopal, Debashis Dutta, Sunil Kumar Jha, Shobhita Kalra, Saumya Bandyopadhyay and Subrata K Das. 2011. Biodegradation of imidacloprid and metribuzin by Burkholderia cepacia strain CH9. Pesticide Research Journal. 23: 36-40. Kunwar Digvijay Narayan, Shachindra K Pandey and Subrata K. Das. 2010. Characterization of Comamonas thiooxidans sp. nov and the comparison of thiosulfate oxidation with Comamonas testosteroni and Comamonas composti. Current Microbiology. 61: 248–253. Madhuban Gopal, Ekta Mishra, Subrata K Das, S.C. Chatterjee, U.R. Sangle and O.M. Bambawale. 2010. Growth inhibition of different pathogenic fungi by actinomycetes and its identification by 16S rRNA. Indian Phytopathology. 63: 137-140. Jyoti, Kunwar Digvijay Narayan and Subrata K. Das. 2010. Gulbenkiania indica sp. nov., isolated from a sulfur spring. Int. J. Syst. Evol. Microbiol. 60: 1052-1055. Digvijay Panday and Subrata K. Das. 2010. Chelatococcus sambhunathii sp. nov., a moderately thermophilic alphaproteobacterium isolated from a hot spring sediment. Int. J. Syst. Evol. Microbiol. 60: 861-865. 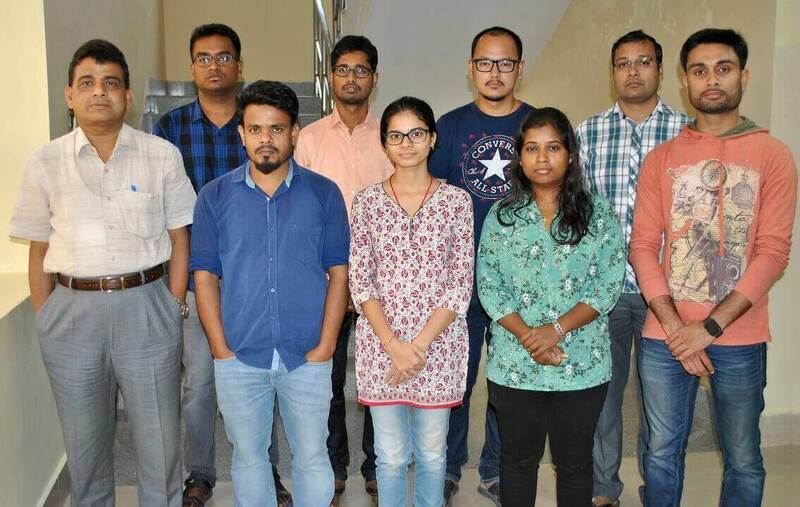 Shachindra K. Pandey, Kunwar Digvijay Narayan, Saumya Bandyopadhyay, Kinshuk C. Nayak and Subrata K. Das. 2009. Thiosulfate oxidation by Comamonas sp. S23 isolated from a sulfur spring. Current Microbiology. 58: 516-521. Sujogya K. Panda, V. Jyoti,Bhaskar Bhadra, Kinshuk C. Nayak, Sisinthy Shivaji, Fred A. Rainey and Subrata K. Das. 2009. Thiomonas bhubaneswarensis sp. nov., a novel obligately mixotrophic, moderately thermophilic, thiosulfate oxidizing bacterium. Int. J. Syst. Evol. Microbiol. 59: 2171- 2175. Madhuban Gopal, Sunil Kumar Jha, Ram Niwas, Livleen Shukla and Subrata K. Das. 2008. Degradation of Cypermethrin by Pseudomonas stutzeri. Pesticide Research Journal. 20: 275-278. Minakshi Patra, Shachindra K. Pandey, Durg V. Singh, T. Ramamurthy, Subrata K. Das. 2007. Characterization of cytotoxin producing Aeromonas caviae (strain HT10) isolated from a sulfur spring in Orissa, India. Letters in Applied Microbiology. 44: 338-341. Subrata K. Das, Uma Shankar Gautam, Pran K. Chakrabortty and Aqbal Singh. 2006. Characterization of a symbiotically defective serine auxotroph of Mesorhizobium ciceri. FEMS Microbiology Letters. 263: 244-251. Nirmali Saikia, Subrata K. Das, Bharat K.C. Patel, Ram Niwas, Aqbal Singh, and Madhuban Gopal. 2005. Biodegradation of Beta cyfluthrin by Pseudomonas stutzeri strain S1. Biodegradation. 16: 581-589. N Roy, Subrata K. Das and P.K. Chakrabortty. 2005. Symbiotic Effectiveness of a Siderophore Overproducing Mutant of Mesorhizobium ciceri. Polish J. Microbiol. 54: 37-41. Subrata K. Das. 2005. Genus Bosea. In Kreig, Staley and Brenner (Editors), Bergey’s Manual of Systematic Bacteriology, 2nd Edition. Vol 2. The Williams & Wilkins Co., Baltimore, pp. 459-461. Hauwaerts, G. Alexandre, Subrata K. Das, J. Vanderleyden, I.B. Zhulin. 2002. A major chemotaxis gene cluster in Azospirillum brasilense and relatioships between chemotaxis operons in alpha-proteobacteria. FEMS Microbiology Lett. 208: 61-70. Subrata K. Das and Ajit K. Mishra. 1996. Transposon mutagenesis affecting thiosulfate oxidation in Bosea thiooxidans, a chemolithoheterotrophic bacterium. Journal of Bacteriology. 178: 3628-3633. Subrata K. Das, Ajit K. Mishra, B.J. Tindall, F. A. Rainey and E. Stackebrandt. 1996. Oxidation of thiosulfate by a new bacterium, Bosea thiooxidans (BI-42) gen, nov., sp. nov,: Analysis of phylogeny based on chemotaxonomy and 16S ribosomal DNA sequencing. Int. J. Syst. Bacteriol. 46: 981-987. The development and implementation of sensors and treatment technology for fresh water systems in India. Funded by Newton-Bhabha Fund. Letter no: F. No. DST/TM/INDO-UK/2K17/30 (c).